There's an age-old adage that there are two sides to every story. There's a lesser well-known adage (but one that's equally relevant) that there are two sides to every balcony and this doesn't exclude the London Vegetable Garden! Whilst I'm promoting the use of any urban space (however small) to grow vegetables and raise awareness of becoming a bit more self-sufficient (why should we give Tesco all our money? 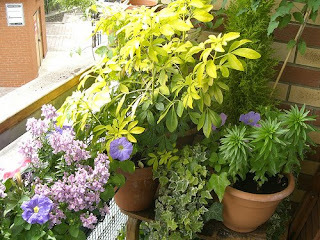 ), the truth is that container gardening extends beyond bags of beans and pots of peas. The photos in this entry show the other side of the London Vegetable Garden. Whereas the much publicised half contains pots of compost, seedlings, canes and grow bags, its twin represents my more botanical inclinations. The modest display you can see in the photos represents a continuing project that's lasted over a year. Whilst the main bush-like plants and ivy have been a constant on my balcony, I've had the pleasure of adding and changing seasonal plants and flowers over several months. Over winter, we had some beautiful pansies that lasted right through until a few months ago, which have now been replaced by some vivid petunias. As Bob Purnell explains in his superb book 'Crops in Pots', one of the most attractive features of container gardening is the ease in which you can move plants around to create varied displays that make a real impact in your garden (or on your balcony). For balconies, one of the easiest and most space-effective ways to get started is to purchase a few window boxes. They make an immediate impact without taking up any ground space. On the London Vegetable Garden, we have one in the middle that's full of floor-length ivy now, turning a concrete balcony into more of a living garden. For more ideas on container flowers and bedding plants that are easy to use, visit your local garden centre or check out the BBC Gardening website. Seizing on the opportunity to snap up a couple of grow bags retailing in Somerfield for £1.29, I spent the afternoon tending to my multitude of gargantuan tomato plants. I'm experimenting yet again and in this instance, am putting some tomato plants into grow bags outside on the balcony, with some more remaining inside on the windowsill. I'm still unsure as to how I'm going to construct a 'bed' for the indoors grow bag (to avoid mess inside the flat), so whilst I deliberated over that produce problem, I set to, transplanting three tomato plants into the grow bag outside. The intention was to sit these pots on top of holes in the grow bag. 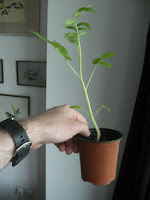 Tomato plants can grow further roots out of their stems, so by offering the plants an extra flower pot's worth of compost, I'm hoping that I've given them another incentive to give the London Vegetable Garden some tomato plants this summer, even if it is only a few! As you can see, I've inserted some plant sticks and tied the plants to them for added support. I've given them a good watering, as it's extremely hot and sunny on the London Vegetable Garden today and hopefully, it'll remain warm enough for them going forward now. Rest assured, progress will be monitored and recorded on your favourite London gardening blog! I've been getting my hands extremely dirty today, but fear not, I haven't been claiming expenses for 'duck islands', toilet seats or mock tudor beams - we have perfectly capable elected representatives for that. Literal dirt rather than political dirt was the order of the day, as I went up to Stoke Newington's weekly farmer's market this morning with my better half. Inspired by Joanna Blythman's superb book 'Shopped' (review to follow soon) and an extreme hatred of shuffling around a zombie-infested Tesco, I decided to check out alternative ways of purchasing the weekly shop. For far too long now, UK consumers have been accepting poor quality, unripe fruit and vegetables from supermarkets that are shafting UK suppliers on price. Yet we continue to flock there in our masses, under the illusion - and a false one at that - that supermarket vegetables are cheaper. Apart from proving an infinitely more pleasurable experience, the visit to the farmer's market yielded some positive results. 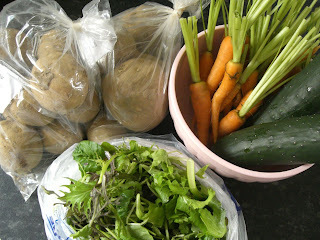 We managed to buy a selection of cheap, organic produce from the farmers that had harvested them only literally the day before - no sitting in supermarket depots for these vegetables! As you can see from the picture above, these vegetables look ten times more appealing than supermarket produce and in fact, collectively, cost less - don't believe supermarket lies! From now on, I'm going to try and make a concerted effort to buy the majority of my fruit and veg from the farmer's market. Exactly one month ago, I added radishes to the expanding list of produce being sown enthusiastically on the London Vegetable Garden balcony. 31 days later and the radish leaves have grown to truly impressive portions, so I thought I'd do a little digging to see just how far they have actually grown. Many gardening blogs, books etc tend to show the reader only what's happening externally, but without testing a few plants, it's hard to see just how far along the organic odyssey we actually are. My rocket is evidently ready to be eaten now (Bank Holiday treat perhaps), but what's going on in pots that haven't shown any demonstrable change in recent weeks? I gently pulled out one of the radishes from the side of the main radish pot, so as not to disturb any roots around the others. In retrospect, I have now learnt that radishes shouldn't be sown so close together - a concept that's hard to avoid when filled with the enthusiasm of sowing tiny seeds in a huge pot! However I have had helpful comments left on the blog and also on Twitter (@londonveggarden) telling me that the radishes on the London Vegetable Garden may just be planted a little too densely to bear a spectacular crop - we shall just have to wait and see what transpires! Anyway, I digress. 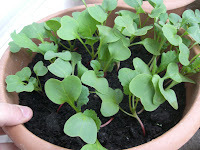 As I said, I've pulled up a radish plant and photographed it to show you how far it has grown after 4 weeks. As you can see from the close-up, a 'radish shape' is clearly visible even at this early stage. Some members of the London Vegetable Garden's Twitter contingent have already told me that once the edible part of the radish starts growing, it grows very quickly indeed, so watch this space! On a slight tangent, I chanced to pop into Somerfield this evening on my way home from the gym and noticed that they were selling big grow bags for a few pounds. This comes as a welcome surprise, as it means a short walk to the supermarket rather than a long and cumbersome journey to the more expensive (albeit superb) garden centre a short bus ride away. No excuses for the tomatoes not to have a nice new home this weekdend! In 1868, Charles Darwin published a book entitled ‘The Variation of Animals and Plants Under Domestication’. 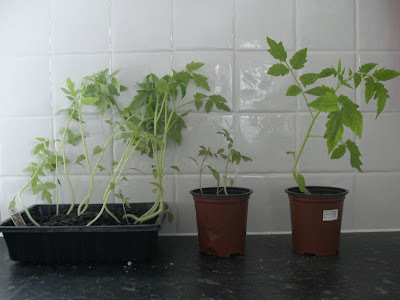 141 years later and I’m publishing a blog entry entitled ‘The Variation of Tomato Plants Under Different Windowsill Pots’. I may not be an internationally-renowned naturalist (and I may not have an impressive Darwinian beard), but I have been monitoring the progress of my tomato plants with an impassioned eye that Mr Darwin would surely be proud of. 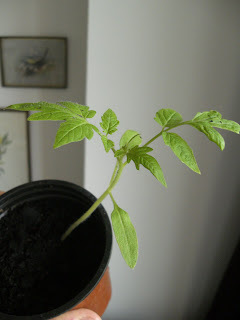 If you root around in my early blog entries from April, you’ll see that I planted my tomato plants from seed, in a few different seed trays. 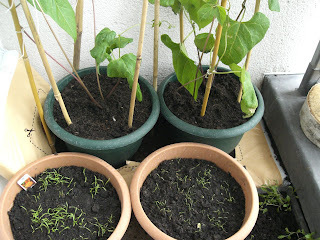 Since then, I’ve re-potted the majority of these plants into pots, typically one to a pot. 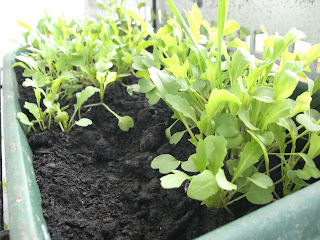 However, I’ve also left one seed tray intact to this day and also planted some instances of 2-3 tomato plants to a pot. I lined the plants up for the photo at the top of this gardening blog entry (they look suspiciously like a tomato identity parade!) and found some interesting results. Expectedly, the tomato plants that have fared the best are the plants that have been planted one to a pot – illustrated here by the plant on the far right. The leaves are clear, defined and several branches are forming. The tomato plants that have spent their entire six-week life in the seed tray have also fared extremely well – interesting, considering they only have approximately an inch of soil to grow in and their roots must be all fighting for the same small space. The tomato plants that are faring the worst however (although still growing) are the 2-3 to a pot examples. They have remained very small – roughly half the size of their fruity friends – and don’t seem to be growing very fast at all. It’s interesting, considering that these plants have more compost and room per plant than the ones in the seed trays, yet the latter have continued to fare significantly better. 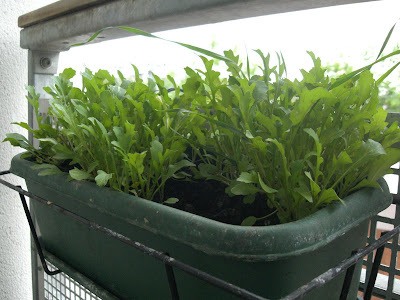 Day 45 Balcony Update – Lettuce Begin! 45 days ago, the world was a much more innocent place. The bubonic bacon bandwagon known as swine flu or ‘H1N1’ had yet to rear its ugly head (sniff), MPs were still nonchalantly claiming expenses for troublesome toilet seats and Peter Andre and Katie Price were still manacled together in marital bliss (at least when Max Clifford was in sight). A lot has happened in 45 days, however the event that eclipses all of these snippets of news is the astounding progress of the London Vegetable Garden. Over the past 6 weeks, I’ve been determined to grow my own organic vegetables from the confines of a dreary London balcony and the resulting crusade has gone further than I ever expected – from mentions in Times gardening blogs and enquiries from London newspaper journalists, this project has grown quicker than my runner beans! 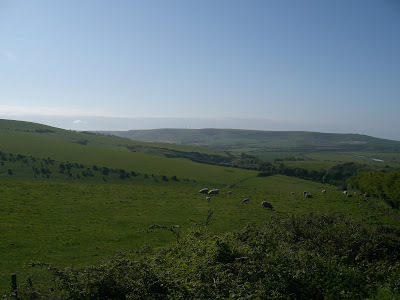 But enough chat – if you want pretentious piffle, my Modern Musings blog is the place to go. Here, I’m checking in with you, my faithful readers, and reporting the current produce progress happening outside the windows of my London flat. As you can see from the new photos, the most impressive result so far is the rocket. After only 6 weeks, this looks like something you could actually eat! I’m waiting for it to get a bit longer before harvesting it, but it’s doing extremely well in its hanging balcony box – and getting a lot of sun every day. The radishes look equally impressive, although I pulled a plant out to examine progress the other night and the stalk is simply attached to a root system – I have no idea when the actual radishes start forming, so anyone who can enlighten me, please leave a comment! The tomato plants are looking sturdier by the day. This weekend, I plan to gamble with leaving a few outside. If that goes successfully, I hope to transfer the tomato plants into a grow bag for their final growing positions – they seem big enough already but once again, any advice from any experienced gardeners is hugely appreciated! On a final note (and at the cost of sounding like a vegan hippy), I’m really beginning to connect with my plants. The tomato plants are filling the flat with an extremely vivid smell that evokes childhood memories of greenhouses and the progress the whole garden has made over 6 weeks is a visible reminder of the care and effort I’ve been putting in. All gardeners say how satisfying it is to grow your own, and with progress like this, it’s not hard to see why. On your own personalised calendars you can track your gardening tasks and growth of plants along with your everyday appointments and holidays. You won't forget the last time you watered the tomatoes - or your mother's birthday! For regular news and updates on the London Vegetable Garden, please subscribe to an RSS feed, follow the blog or join me on Twitter: @londonveggarden. 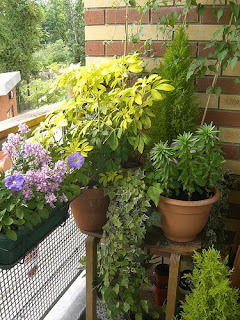 A balcony, despite its confined space, is a luxury that many green-fingered Londoners simply don’t have. 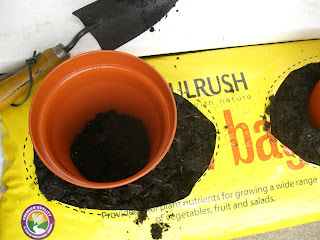 Whilst this blog aims to record my progress as I attempt to grow vegetables on my balcony, I’m also trying to promote awareness around green issues and the fact that ANYONE can grow a few things, even if it’s on a windowsill! Whilst I’ve focused my agricultural attentions on producing a variety of vegetables right here on my London balcony garden, I’ve overlooked one of the simplest and easiest ways to start enjoying growing your own within a small London home – the humble herb garden. Regular readers will be aware that I’m growing coriander plants from seed (a wonderful addition to any salad), however on the Bank Holiday weekend, I purchased some herb plants to put on the kitchen windowsill. One of the real attractions to growing herbs (apart from their ability to freshen up any salad or evening meal, straight from pot to plate) is the fact that they are easy to maintain and even a complete beginner can manage them. Simply a sunny ledge and regular watering will ensure that you have a constant crop of fresh seasoning that tastes infinitesimally better than expensive supermarket offerings that wilt before you’ve got them home. 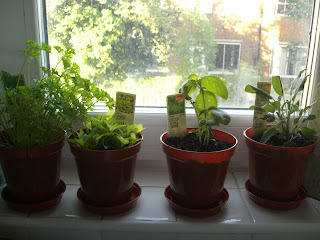 On our kitchen windowsill, we have four pots of herbs growing; curled parsley (Petroselinum crispum), basil (Ocimum basilcum), oregano (Origanum vulgare) and sage (Salvia). I’ve looked on a leading supermarket’s website (one that will remain anonymous, since the London Vegetable Garden is too poor to incur libel costs) and fresh packets of herbs all retail at around 79p, with a ‘short product life’ warning emblazoned next to them. Let’s say you needed some fresh basil for a mozzarella and tomato pasta salad – why waste 79p when you can have a pot that is as fresh as you can get and will last you months? These particular pots were part of a 4 for £5 offer, meaning that financially, growing your herbs is an extremely viable way to save money whilst enjoying better, fresher organic produce – why would anyone choose not to?! So if you’re thinking that you’d like to start growing your own, but have no idea where to possibly start, herbs are an ideal, easy and satisfying way to start your foray into growing your own vegetables in little or no space. These pots are available in supermarkets and garden centres, but if you’re feeling particularly adventurous, why not try growing a few from seed – my coriander is showing recognisable leaves after only a few weeks!. For tips on growing your own herbs, visit the BBC Gardening website by clicking here! As interest in the London Vegetable Garden continues to rise (check out our reference on the Times Online if you haven’t already), more and more of you are emailing or leaving comments requesting information on how to start vegetable gardening in a small space or on a balcony. The London Vegetable Garden simply started off as an idea one weekend, but there are many dedicated and authoritative books upon the subject of micro-gardening, growing plants in small places and city vegetable growing. 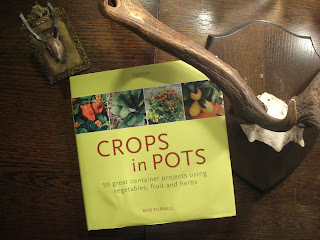 Last weekend, my Dad gave me a fantastic book called ‘Crops in Pots’ by Bob Purnell. After an enthusiastic read on a train back to London following my recent Sussex sojourn, I wholeheartedly recommend this vegetable volume for anyone considering starting their own miniature vegetable growing project! ‘Cops in Pots’ starts off by describing in detail what pots to use, how to plant your vegetable pots, what compost to use and ideal positioning, giving any amateur gardener more than enough information to begin. Purnell then goes on to mention what pests and diseases to look for, how to treat these, feeding your plants and general care. Whilst this is clearly a great book for anyone considering growing a few vegetables in a small space or on a balcony, one of the best bits about this book is its many ‘projects’. It lists several different container combinations for you to attempt, depending on what food you’d like to compliment, such as pasta pots, select salads, textural treats and green garnish. Whilst these all allow for wonderful organic vegetable combinations to be harvested, they remain extremely simple, easy to grow and most importantly, all of these can be achieved in a pot on a balcony – just like the London Vegetable Garden. If you’ve been inspired by the urban gardening projects brought up by following the London Vegetable Garden, Bob Purnell’s ‘Crops in Pots’ is an ideal starting point for any green-fingered city gardener. Highly recommended. 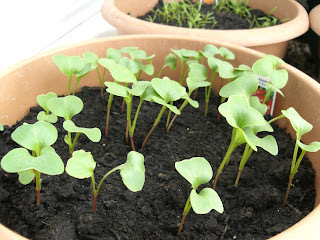 To purchase ‘Crops in Pots’ on Amazon.co.uk, simply click here. The London Vegetable Garden makes Times Online! The London Vegetable Garden is picking up followers fast! The Twitter account @londonveggarden now has over 100 followers, one of whom is eminent cook, food writer and TV chef, Celia Brooks Brown! Celia writes a weekly blog for the Times Online, ‘Urban Farmer’ and in her recent article, references the one and only London Vegetable Garden, showing we have friends in high places indeed! To read the article, simply click here! Whilst I wouldn’t describe the Homebase Bank Holiday experience as ‘relaxing’, it was a necessary evil that resulted in some enjoyable gardening activity in the London Vegetable Garden this afternoon. 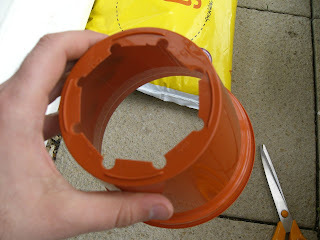 The main job completed today was the (rather complex) task of cutting holes into the runner bean pots and sitting them onto a grow bag. When I disposed of last year’s runner bean attempt, the entire soil was densely packed with roots. In order to give the roots a bit more space this time round, I’ve opened up a grow bag and sat the two pots, sans-base, on top. The roots should hopefully now have a lot more space to grow into, which should have a positive impact upon the harvest – we hope! Admittedly, removing the bottoms from the pots with beans already in was an extremely difficult task and I’m concerned that I’ve disturbed the plants. However, previous experience has shown me that runner beans are hardy vegetables, so hopefully they haven’t been too badly unsettled. For future reference, this set-up should definitely be implemented the minute the seedlings are big enough to be transplanted from their original seeding positions – I guarantee it will avoid turning into a garden grump, like I did this afternoon as soil and roots went flying everywhere! Hopefully this work will enable me to maximise my harvest of runner beans, with the added benefit of taking up no extra space. Since the pots are sat on top of the grow bag, the only space used is a few inches of height, so this is definitely a top tip if you wish to grow vegetables on your small balcony or roof garden. Along with clogged-up motorways and visiting family members you’d really rather not, the Bank Holiday invariably shifts people’s attentions to the garden once again, even if only for a few hours of mowing or barbequing. Whilst not a middle-aged dad who’s finally been roped into tidying up the back garden before the mother-in-law comes over, my girlfriend and I do intend to join the legions of harassed husbands at a Homebase later this morning. Keen to make the most of the Bank Holiday weather (which, strangely for England, is actually warm and sunny), I want to spend some time outdoors before I return to the daily commute and eight hours cooped up in front of a computer screen. 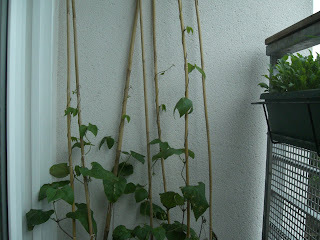 The main task I’d like to get sorted is the grow bag base for the runner beans. These vegetables have incredibly fast-growing and extensive root systems and the pots they are currently sat in don’t offer them enough space to grow. 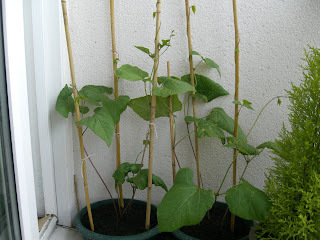 One of the London Vegetable Garden’s followers kindly emailed in with some tips, suggesting that a bottomless pot sat on top of a grow bag would reap dividends for the roots and subsequently, the runner bean crop. Here on the London Vegetable Garden, we do enjoy our flowers too! The pansies that lasted through the winter have now succumbed to fatigue and have joined that big compost heap in the sky – worryingly, I think white fly is partly to blame. 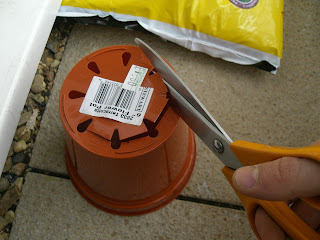 With this in mind, I’d also like to sterilise these pots and bed-in some new flowers. I intend to sit down and record the day’s events later on this evening, but until then leave you with some recent pictures of how the various vegetables are progressing. The radishes are especially impressive! 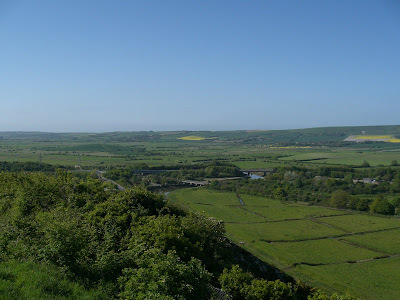 I haven’t posted anything for the last few days, as I’ve been back down in Sussex helping my mother to move house. In my absence, the wonderful girlfriend has been looking after the London Vegetable Garden and keeping everything watered and content. Although she’s done a sterling job, I think she’s breathed a huge sigh of relief that I’m back and that no plants have died on her watch!